While Emu Casino was established in 2012, they recently underwent a complete makeover known as their ‘2015 Relaunch’, where they did up their site with new navigation features, as well as added new software developers including one of the top leading software providers, NetEnt. 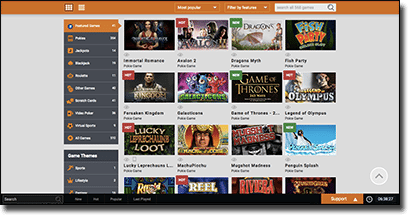 With new search functions and a user-friendly layout, it's quite easy to locate the number of keno titles available at Emu Casino amongst the huge catalogue filled with numerous software providers. Emu Casino revamped a lot of their promotions, including their welcome bonus along with its terms and conditions, and even added a new unique bonus. Note that all keno titles fall under the ‘Other Games’ category and only contribute 10% to the wagering requirements, while pokies and scratch cards contribute 100%, so while you can still play keno and contribute to the turnover rate, it won’t be as quick as it would be with slots. This is a new and unique bonus for new players. Similar to the welcome bonus, the register bonus is only for new players. However this bonus doesn’t require players to make a deposit, rather all they have to do is create an account and they are awarded $3 to play with. This doesn’t seem like much but you don’t have to deposit anything to receive it so it is worthwhile taking advantage of. Only Aussie and NZ players qualify and it does need to be wagered 40 times (only on the pokies) to release winnings, but it is a fun way to try out the slots here with real money without depositing real money. But since we are keno enthusiasts we can focus more so on Emu Casino’s other promotions. When new players sign up at Emu Casino and go to fund their accounts, they receive the option to opt in for the welcome package. This involves up to $100 matched by 100% over a single deposit. Before their relaunch the bonus was at a massive $1500 over three deposits, but we think smaller welcome bonuses are generally better for the average player who has a smaller bankroll. It is important to note that there is a 40x turnover for Aussie and NZ players (45x for players everywhere else). You can contribute to the turnover/wagering requirements by playing keno too as mentioned above, but the maximum amount per bet that counts to the wagering requirements is $15. Every registered player is instantly signed up to the VIP club where you are awarded for regularly depositing and playing at Emu Casino, with keno games counted as games you can regularly play and earn points on. Additionally on your birthday, provided you have made at least one deposit, you will receive a gift, though the more you have have deposited and the more you have played, the better the free gift will be. Despite Emu Casino being made over, it has always offered its casino on a flash platform only, which is perfect for Mac users and PC users who don’t enjoy downloading the software to their overcrowded desktop. Therefore players can access the substantial amount of keno titles via their browser, regardless if they are using Safari, Chrome, Internet Explorer or Firefox. Originally Emu Casino had over 500 casino games available, but with the addition of three new software developers they have even more now including the addition of new NetEnt games. All of their software developers which we list just below, offer their games on the flash platform meaning no one misses out on any games from Emu Casino’s catalogue. Besides the addition of the new software developers, the new layout is quite possibly the most exciting part of the ‘2015 Relaunch’ due to the number of user-friendly features it includes. Command controls: The search bar was always a feature of Emu Casino, and since it is a convenient one it has stuck around. You can simply enter ‘keno’ into this search bar to see all the available keno titles. However, the new command controls include links to the support page, faqs page, and more. Game filters: More and more online operators are adding the option to filter games and Emu Casino have done so too. Players can pick from the type of games, the theme, and the software provider on the lefthand panel, while they can pick to order the results from ‘Most popular’, ‘A-Z’, or ‘Z-A’. They can also filter the features of the game but these are suited more so to pokies as they include the option to pick the number of paylines, ways to win, free spins, etc. Overall the new layout is easy to use and we can find our favourite keno titles quite easily. There are seven keno titles available at Emu Casino meaning players get a large amount of variety in terms of software providers, and in turn the titles too. Keno: This title by Microgaming is a standard keno title which allows players to pick 15 numbers from 80. 20 are called out and the numbers turn red/orange when you get them correct. The minimum bet is $1, while the maximum bet per game is $10. Video Keno: Video Keno, by Multislot, visually appears to resemble the classic way you would play keno with a form and a ball machine. There are the standard 80 numbers but players can only pick up to 10 on this version. The minimum bet is $0.10, while the maximum bet is $5. Jackpot Keno: This one is a unique variant with a vast betting range from $0.05 right up to the maximum of $20. Created by 1X2Gaming, Jackpot Keno allows players to pick up to 15 balls out of 80 (20 are drawn) can speed the game up by clicking on the ‘Turbo’ option and then on ‘Play’. 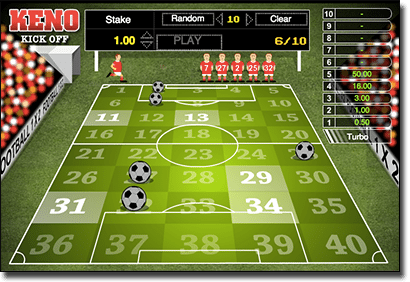 Keno Kick Off: If you enjoy keno but want a unique version, Keno Kick Off by 1×2 Gaming is a good option as it places the keno layout on a soccer field. Players pick up to 10 numbers by clicking on the spots on the field, with only 40 numbers available to choose from. When you press play a member of the soccer team runs out and a ball drops on the spot that is drawn. The ‘random’ and ‘turbo’ function is still available and the minimum bet is $0.10, while the maximum is $200 making it a unique variant for the high roller. 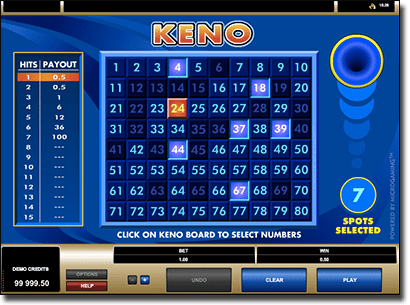 Keno: Another traditional keno title by 1×2 Gaming, but this time players can opt to pick their numbers or spots randomly by clicking on the ‘random’ link. The turbo option is available on this title too, while the minimum bet is $0.50 and the maximum is $200, which makes it a great option for a high roller keno player. Keno Lab: Keno Lab is a traditional style game but is set in a lab. It is yet another title by 1×2 Gaming and allows players to pick up to 15 balls out of 80, with 20 drawn. The results roll out of a test tube, with the minimum bet $0.50 and the maximum $200 again. Kenotronic: Kenotronic, the last keno title by 1X2Gaming, is exactly like Keno Lab but with a different setting and a minimum bet of $0.10 and a maximum of $200. Emu Casino also re-did their mobile site and updated their games catalogue with a substantial number of mobile games. Unfortunately there aren’t any available keno titles for smartphones and tablets (including Apple, Android, Windows, Blackberry, etc., devices) just yet, but you can play an array of pokies, video poker, and more. There are an abundance of Aussie-friendly payment methods available so you can make a deposit and play keno with real money. High levels of security technology implemented by an online casino is important when using our personal details, as well as when entering financial information. Emu Casino don’t slack on this and have implemented modern encryption technology called TLS 1.2, as well as a 128-bit key (this means it would take approximately 100 years to crack into to view your details), which can be viewed by clicking on the padlock in the URL toolbar. We always say how important contact services are at online casinos because if we are having trouble, for example a keno title isn’t working for us, we want to be able to get immediate help. Aussie players can ring 02 9119 2932, while New Zealand players can ring 09 951 5843 for immediate assistance. Sign up to EmuCasino.com today to redeem their new player welcome bonuses and play the very best online keno games available on the Web and mobile.